Indio, CA: A reminder to all Greater Coachella Valley Chamber of Commerce business members, as a member you are entitled to two free tickets to this weekends arts festival at Empire Polo Club (value $30). When you arrive, visit will-call and let us know which company you are with, and who your primary contact is on your membership. It’s that’s easy! The Southwest Arts Festival® Indio 2019 will be held on January 24, 25, 26 and 27, 2019. 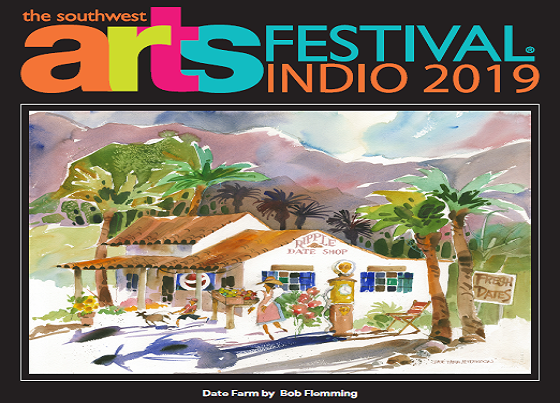 Now in its 33rd year, The Southwest Arts Festival® will once again be held at the Empire Polo Club in Indio, California. Empire Polo Club is an international destination renowned for its natural beauty, featuring natural landscape and sweeping mountain ranges. Every year the Arts Festival continues to evolve and attract a high caliber of talented artists and unique artwork. This year’s festival will feature interactive art displays and live music, with pottery, glass and fine art painting scheduled to be on display. Visitors can also enjoy a variety of dining and beverage options while casually walking the grounds. This year the festival will be accepting 250 of the most accomplished artists from around the world to show. Recognized as one of the Top 100 Events in North America by Travel Magazine, the festival includes traditional, contemporary, and abstract fine works of art and quality crafts. The festival’s reputation for first-class quality and professional integrity make it one of the country’s finest juried art festivals. As one of the largest annual fundraisers supporting several Coachella Valley based nonprofits, the festival is exceptionally fortunate to have over 200 community leaders and volunteers who contribute numerous hours to make certain that the festival is successful. The festival is open daily from 10:00 AM until 5:00 PM. 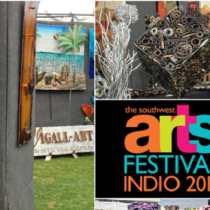 For additional information on The Southwest Arts Festival® Indio, visit SWArtFest.com, or call 760.347.0676.